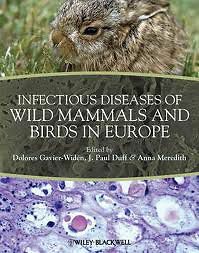 Infectious Diseases of Wild Mammals and Birds in Europe is a key resource on the diagnosis and treatment of infectious diseases in European wildlife that covers the distinctive nature of diseases as they occur in Europe, including strains, insect vectors, reservoir species, and climate, as well as geographical distribution of the diseases and European regulations for reporting, diagnosis and control. Divided into sections on viral infections, bacterial infections, fungal and yeast infections, and prion infections, this definitive reference provides valuable information on disease classification and properties, causative agents, epidemiology, pathogenesis, and implications for human, domestic and wild animal health.  Brings together extensive research from many different disciplines into one integrated and highly useful definitive reference.  Zoonotic risks to human health, as well as risks to pets and livestock are highlighted.  Each disease is covered separately with practical information on the animal species in which the disease has been recorded, clinical signs of the disease, diagnostic methods, and recommended treatments and vaccination.  Wildlife vaccination and disease surveillance techniques are described.  Examines factors important in the spread of disease such as changing climate, the movement of animals through trade, and relaxations in the control of wide animal populations.